I’m trying to be more organized and clutter free this year, so I decided to clean up this blog with a shiny new theme. If you can’t remember what the previous theme looked like, you can view it here. Without going into great detail, I eliminated all the extra sidebar links and am showing post snippets on the homepage for easy browsing. Ultimately, I want readers to find what they need as quickly as possible, then get on with their lives. By the way, the sidebar is a bit light on useful links at the moment but will be updated soon. So now it’s your turn, what can I do to make your visit better? 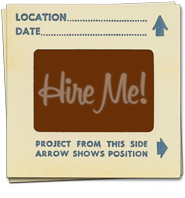 I wanted a retro feel – imagine Napoleon Dynamite’s home office – so I chose cork board, tacky wallpaper, and some old school Dymo embossing labels. If there is a way to incorporate a 5.25″ floppy, I will. By the way, the light bulb is supposed to be a button, like the kind you wear on your shirt… then pin up on a cork board… yep. Now I know the reason of your absence for a quite long time, I did not see new post. You prepared the new design. Anyway, I like this new look…I think periodic design changing is good. Thanks Daniel! And yes, I did spend some time and energy on this new theme since I had to relearn some WordPress code and css styling. Thanks Mark, and congrats on all the good stuff that you’ve been putting out on Search-This! I always look forward to seeing new posts in my feed reader from your crew. Excellent theme, although I liked the other also. This one seems a bit more professional. Congratulations. Thanks for the feedback Mark L, I was hoping that it might strike people as being a little more professional! This design is excellent. I like the header at the top, and you’ve done a great job with the usability. It says what it is right off the bat, the categories are used in an intelligent way, and you’ve got a good combo of wordpress plugins to make this pretty usable. Props, Tomas! Thanks for the ‘props’ and feedback Josh! Oh, and see you at the next PACT meet up! I not only like the design, but the content is even better. 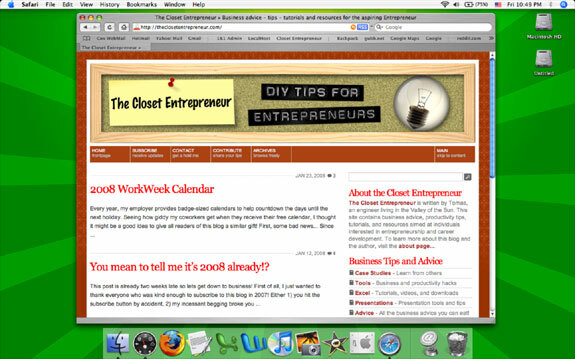 DIY Entrepreneurship has my vote and I will definitely blogroll it on my blog about our favorite topic on revenuweb.info.